Ordinarily, my wife and I would share a “he said, she said” review following our time on Windstar Cruises’ Wind Spirit in Tahiti, but we thought we’d try our hand at a tips piece this time around instead. 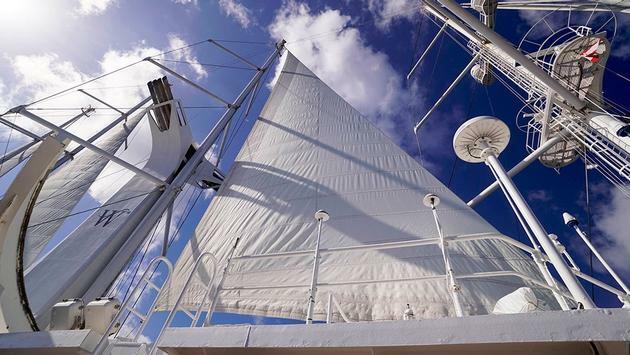 The Wind Spirit is a stellar sailing yacht. However, due to its smaller size, it does rock more than a larger cruise ship. Admittedly, I have a weaker constitution than one might expect of a veteran traveler, but its profile is worth noting for others prone to motion sickness. Surely, this should not stop you from coming along! The best way to prevent any discomfort is by reserving an ideal stateroom. Choosing one lower in the ship and as close to its center as possible will physically reduce the sensation of pitching, rolling and yawing. Alas, I drew the short straw (by virtue of my typical side of the bed) to end up at the nightstand with no electrical outlet. Luckily, we came prepared with a USB battery pack so I could still charge my phone bedside overnight. The stateroom itself has plenty of outlets, but if you need to be within arm’s reach of your phone like I do, plan ahead. Perhaps the single greatest feature of the Spirit’s standard staterooms is their dining nooks. Rather than simply having a sofa bench, an adjustable and extendable table sits between two cozy seats which are perfect for 24-hour room service. The round-the-clock menu is already rather tasty, especially the quesadillas and option to order popcorn for a casual in-room film screening. Even more elaborately, the main dining room menu can be delivered with no hassle should you prefer an entire evening in. I love a beverage package, and there are a couple of things that make Windstar’s stand out: First, you can purchase it for only one guest in the stateroom. Second, you can purchase different tiers. The basic wine package is $32 per day while the premium wine package is $42 per day and the Captain’s Exclusive Beverage Package—which includes wines, beers, cocktails and minibar items—is $52 per day. Of course, it’s always wise to do the math and figure out if purchasing a drink package is worth it for you, but I love anything and everything I can pre-pay. I can more fully relax on vacation when I’m not constantly checking the bill. A sailing ship would not be complete without a proper bowsprit and sheets, and the Spirit has both. The former is ordinarily off-limits to guests given its position forward of the mooring deck, but it is accessible when accompanied by the crew. When scheduled, this is a prime time to have a fun “king of the world”-style photo taken. Also, the ship’s signature sail away is beyond dramatic. Its set to Vangelis’ “1492: Conquest of Paradise” film score as the sails are mechanically unfurled high above the decks. It’s yet another classic Kodak moment, particularly if you have a wide-angle lens. If you’re going to purchase any extras on your trip, the laundry package on Windstar should be at the very top of your list. Compared to other lines, it is very affordable at $16 per day for double occupancy. That’s a little over $100 for a 7-night cruise. There’s nothing better than arriving home from a trip with a suitcase full of clean laundry. We sent out a batch every day before 9:00 am, and it was clean, pressed and back in our stateroom usually before 5:00 that same day. Another great freebie experience onboard is the Watersports Platform. This marina conveniently folds down right off the stern and allows guests to swim, kayak, paddle board and even water ski directly off the ship. We loved the first two, not quite bringing ourselves to try the latter pair—at least not yet. Best of all, once you are through with your adventure, you can quickly dry off and head straight to your cabin for a shower. At the beginning of your cruise, guests can check out snorkel gear (mask, snorkel, and fins) from the Watersports Platform to use for the duration of your trip. The bag stows nicely beneath the bed. It’s extremely convenient to grab and go when you have an excursion that includes snorkeling, or if you want to venture out on your own in port in search of sea life.